Francesca wrote: “Hello Kurma, I would like to make my own Moroccan seasoning. would you please give me the recipe so that I can make my own”. My reply: ‘Baharat‘ is the Arabic word for ‘spice’ (based on the word ‘bahar‘ meaning pepper). It is sort of an Arabic garam masala if you like, an all-round hot-sweet spice mix. 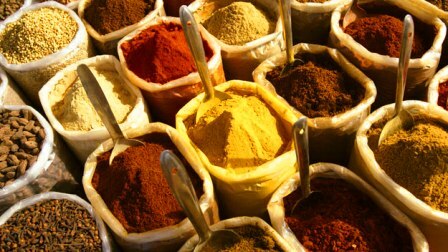 Here’s my favourite homemade baharat spice, plus a few others. I tend to make small amounts. Fresh is best. Dry roast the first 6 spices over low heat in a heavy frying pan until they become slightly darker and aromatic. Grindthem in a mortar or electric spice grinder. Combine with the nutmeg and paprika and store in a sealed jar. Makes about 3 tablespoons. 1 teaspoon ground noomi basra (dried lemon or lime). 1 teaspoon freshly grated nutmeg.